Caution: Keep Away From Any Source Of Flame. 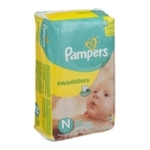 Pampers Diapers, Like Almost Any Article Of Clothing, Will Burn If Exposed To Flame. To Avoid Risk Of Choking On Plastic, Padding, Or Other Materials, Do Not Allow Your Child To Tear The Diaper, Or Handle Any Loose Pieces Of The Diaper. Discard Any Torn Or Unsealed Diaper, Or Any Loose Pieces Of The Diaper. To Avoid Suffocation, Keep All Plastic Bags Away From Babies And Children.